Application architecture depends on business and functional requirements of the app. For those requirements to specify the right outcome, they need a clear and strong vision. In truth, your big picture idea dictates the architecture of your app. And if you cannot articulate your vision with a couple sentences in 30 seconds or less, you will have a difficult time defining the functional actions the application will take. Our product helps [customer] solve/meet [problem/desire] by [unique solution]. for a cab by providing a fast, one-click ride hailing service. It’s quick, to-the-point, and covers all the bases. You can see a target audience, an identified problem in need of a solution, and the unique solution itself. Using a construction metaphor, the foundation has been excavated and poured, preparing the way for blueprint implementation. Almost simultaneously, you need to gain comprehension of the end user. 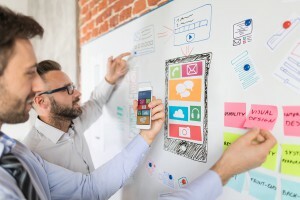 Before you can turn your idea into app architecture, you need to answer the question of “who is the end user?” to determine the value proposition your application would offer and the functionality it would need to deliver. That means creating a buyer persona for your super users, a.k.a. the people who will readily engage with your application and respond enthusiastically to mobile re-engagement strategies. Who are the buyers? – These are the basics: age, gender, income, occupation, nationality, marital status, home ownership, and even pet ownership. Get these answers and you can quickly determine broad end user needs. What do their lives look like? – This takes a deeper dive into the end users’ lives. What is their work life like? What are their hobbies? Are they engaged in their community? Questions like these can reveal opportunities beyond the surface level concerns. What do they value? – If you know what is important to buyers, you can narrow down which of their problems you need to address. With this question, it’s equally important to determine the negative side of their values (what people fear, dislike, and try to avoid), so that you can either prioritize them or evade them with your solution. What drives them? – Buyer personas that thoroughly comprehend what will trigger users into action will have little difficulty building up a loyal user base and steady revenue stream. However, that requires each preceding phase to have been done meticulously so that you can accurately extract end user motivators from all the information that has come before. During this process, you will clearly define a variety of different problems facing your user, but what is most important to remember is that your application architecture does not need to solve them all from the outset. If you focus on the most important challenges to solve, you can build your MVP, get your product into the market quickly, and layer in future functionality around the original core idea. Thousands of applications have failed because they didn’t have any app monetization strategies in place before their launch. They might have been able to attract a user base, but they were never able to capitalize on their interactions. In truth, it’s because the structure of the mobile application dictates your ability to utilize in-app purchases or subscription services. Otherwise, you’ll often need to take your application back to the drawing board, which can be a costly detour for an application that has already been launched. How do you go about monetizing your app? For starters, it’s important to research which in-app revenue strategy is most profitable for your type of application. Mobile games are designed with in-app purchases in mind, but other applications are better suited for the freemium or subscription approach. Working with a mobile app development company can help to accelerate your research, since companies like Red Foundry see first-hand which monetization strategies work for which types of applications. Either way, you need to determine how to monetize your mobile app from the outset or risk missing out on potential revenue. Want to prepare your application for a successful launch and a scalable future? Contact Red Foundry and we can help you create the right foundation from Discovery & Design through development, testing, and ongoing maintenance.